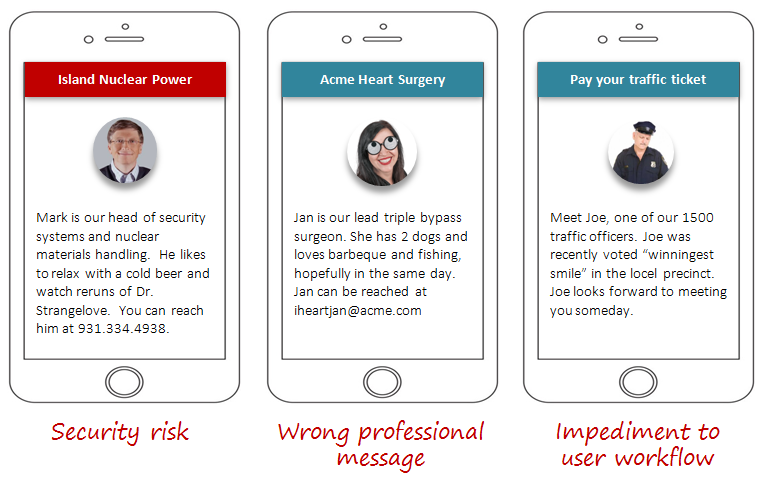 A popular technique to attract customers and instil trust in them is to “humanize” your website. You want to make it appear that there are actually people behind the users’ screens and that those people are friendly humans with lives just like you. To humanize your website means making it remind readers that there are people working behind the scenes that he/she can trust. It’s about creating those relationships through your content. Include photos of your staff and premises on your ‘about’ or ‘contact’ page. Make sure photos around your shop or building have people in them. Showing you actually exist in the real world can help to cut through the scammers and creates instant trust. Add the email addresses of staff too, especially sales staff, rather than something generic such as sales@sitename.com.au. Blog about internal events and milestones within your company. As your company celebrates birthdays, anniversaries or special ‘customer only’ days, share event photos online to give your customers a glimpse ‘behind the scenes’. This provides your customers with a sense of being privileged and is a great trust builder. But my question is, when does this go too far? For example, I obviously want to include information about who we are and what we do. But do I want to include “personal stories” from any or all of my staff? Do I want to talk about the company’s scenic location even if the website is meant for users countrywide or even worldwide? Where do users draw the line between “not knowing enough about who they’re dealing with” and “too much information I don’t need to know”? I wouldn’t want to go through the supermarket checkout and have the cashier tell me his life story. Note: This is specifically related to e-commerce companies that sell nationwide, but would like to hear more general answers as well. Like many other design approaches, humanizing an interface has advantages and disadvantages and as such, is correspondingly prone to overuse and misuse. I'm not a fan of humanizing as a goal. Websites are not humans, and trying to humanize a website is useful only if it actually improves user experience or productivity. e.g. for a site where the organization is trying to build a relationship with the user, it may be helpful to humanize the site as a means to accomplishing that goal. Security fail - Exposing employee details can present a security risks for personnel, an organization, or an entire country. Messaging fail - Over-humanizing a website or humanizing the wrong aspects of a team may destroy a user's sense of objectivity, professionalism or skill for websites where these are important attributes to communicate to users. Workflow fail - Inserting humanizing content into a website at the expense of helping a user get her job done (paying a parking ticket, in the example above), may worsen rather than improve user experience. The list obviously goes on, but hopefully these examples serve to underscore the point that humanization is a design tool and not a goal, and so its underuse or overuse must be determined relative to the proper objectives of a website or interface. I would say it's too humanized if it hinders the users in finding the information they visited the site for in the first place. I once visited the website of the local supermarket to find out their opening hours on a holiday. I entered every menu option i could see, but couldn't find the opening times. Instead, I found a lot of pictures of smiling employees, press releases, generic marketese and a lot of ads. Even their FAQ was full with things like "Why are your special offers so exceptional?". Did the designers really think that these are why people would visit their website? 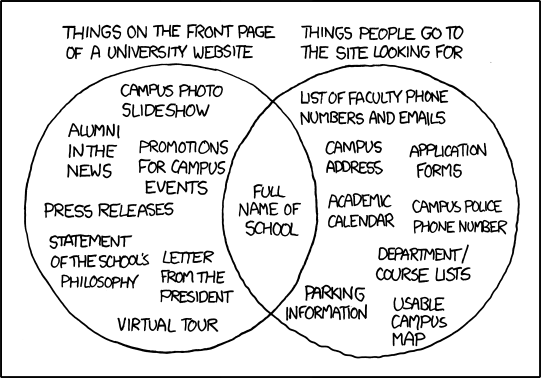 This xkcd Venn diagram illustrates beautifully how "humanization" can go wrong, even in the case of websites not specifically created to sell you a product. An experience is overly personal when it shares irrelevant details that get in the way of the message. Humanizing is just explaining things in terms of people rather than systems, not telling someone’s life story for no reason. When it begins to feel disingenuous, which is nearly always. In fact, most attempts at 'humanization' result in absurdities that people are so numb to by now they just ignore it. It's just noise at this point. Why generate more noise? Do something more productive. "Hello! Welcome to our site! What would you like to do today?" This is, for some reason, really common. I'm being 'greeted' and welcomed by no one. It's just static text, and there's nobody on Earth who doesn't know that. Not a single person anywhere, ever, has had a warm cozy feeling of welcome upon reading this text. I'm being asked what I'd liked to do, as if someone is eagerly awaiting my answer (via what, a text box? Should I just say it out loud? ), when in fact the 'answer' is to click a link. Which is the most basic function of a web page. It's the same effect you get when a phone hold systems tells you how important your call is, repeated by a robot exactly every 90 seconds. The truth is the opposite of what is being said, and has the opposite effect. Yet people continue to do it, because everyone keeps doing it. I booked a haircut this morning, and noticed the text roll at the top: "Get ready to enjoy the <companyName> life! You deserve it!" What does that even mean? You have a brand of... life? What exactly did I do that made you think I 'deserve it'? Deserve what - to buy stuff from you? Such a bizarre slogan. The 'personal' aspect of it just makes it creepy. Even worse are 'personalized' recommendations. Netflix is awful at this. "Based on the fact that the last film you watched had a title that began with the letter 'S', we think you'll love these other films whose titles have the letter 's' in them." It's not that their recommendation system needs work; it's that their attempt to 'humanize' it makes it seem even more absurd and impersonal. Like any text on your page, it should have a specific purpose. It is competing with every other element in your design, so it had better carry its weight. Give your user some credit, and carefully consider what value you think such 'personalization' will really bring. Humanizing is OK as a design tool if used sparingly, though I think people are smart / cynical enough not to be fooled by it. What ever you do DO NOT ANIMATE. Sounds are even worse. This is extremely distracting to the user. The user has come to your website to perform a task and you are effectively trying to hijack their attention. All those who remember the Microsoft Office animated paperclip will know what I mean. The only exception is websites where the user has come specifically to entertain themselves with, e.g. games on the website. If you want to have a photo of a model to help draw attention to a special offer, go ahead and do it. Just don't have them moving / talking. Think about why you need a humanized presence. The UK rail information service has "Lisa" http://www.nationalrail.co.uk/1924.aspx , who evolved from an animated photo of a woman trying to look helpful (it was excruciating) to a static photo, and in her current incarnation is a cartoon. Having the persona of Lisa here is somewhat helpful, because "she" does respond to your queries in a slightly different manner to a simple search engine, and the humanization highlights that. Incidentally, here is Lisa's Spanish counterpart Irene http://consulta.renfe.com/base/main . "She" does speak English, but as you can see is animated, which is very annoying. Irene has on occasion asked me to query in natural grammar rather than treat her like a search engine, but of course I am used to treating bots like her as a search engine and it seems odd to use natural grammar. On the subject of putting real (as opposed to fictitious) employees on the website, bear in mind the wishes and rights of your employees. Is it really worth compromising their privacy? If someone leaves (or is fired) will you maintain the website to quickly remove the photo? It only really makes sense if the user is actually going to interact with these people personally. For example my dentist has all his staff's photos on his website. It's nice to see the faces of the people who will be thrusting bits of metal into my mouth before I meet them personally and they actually do it. People are now quite happy (or even prefer) to deal with an impersonal website or call centre, until something goes wrong / gets complicated. I heard from an employee of an insurance call centre, that all the complicated cases were directed to either of two names: either a male one or a female one. The teleoperator could match the gender of the name to their own gender, thus giving the caller the impression that their issue was going to be handled personally by the teleoperator they spoke to. It also relies heavily on whether or not a physical appearance will justify your pitch. For things like sales, fitness, cooking, etc. these all require a key portion of you (or us) in them. Also doesn't scale well. I hate viewing companies of developers whom their 'about' page shows a masonry of all employees, some with good information filled in, others with lazy information filled in... I've seen one with like 40 people once.. Turned me off. I submit that you can't go too far with humanization. Just look at the Ling's Cars website and how it goes crazy overboard with it...but it not only works, it has worked well. Take a look at their employees page. It's hard to be so masterfully tacky, tasteless, and make millions. But, the world's worst website...works. Do what you need to do in order to make things work. Conventions are just that--not rigid, immutable dictates of the universe. Not the answer you're looking for? Browse other questions tagged interaction-design e-commerce best-practice customer-experience or ask your own question. What is the best eCommerce add-to-cart flow? B2B / B2C two separate websites, same URL, benefits vs. problems?